On Saturday, April 18, Casey Trees will helping re-tree historic Anacostia as part of our Earth Day-Week festivities. 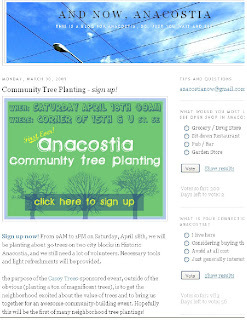 It's great to see the Anacostia neighborhood really rally around this planting as shown in the And Now, Anacostia blog. If you are interested in helping to plant - there are 30 trees scheduled to be planted - click here to register. For those of you looking for an alternative way of celebrating Earth Day consider joining our Tree Walk along the grounds of Ceder Hill, the home of Frederick Douglass. The walk will be led by City of Trees author Melanie Choukas-Bradley and include a tour of the home. Learn more here.